Evil Twin is an interesting operation. In the unlikely event you have any free New York Times articles left on the 28th of a pretty newsy month, you can learn nearly everything I know about that operation here. A quick summary: It's a contract-brewing company run out of Brooklyn by a Danish guy who doesn't get along with his twin brother. That twin—the good one I guess? Or the other evil one? Or the neutral one, I suppose, which would be so boring—the one who doesn't run Evil Twin, he runs Mikkeller, a big-time international contract-brewer headquartered in Copenhagen. Both Jeppe and Mikkel Bjergso are excellent at what they do, so it's for the greater good that their animosity prevents them from co-running just one family beer company. We've long known that beer can lead to an increase in family dysfunction, so it seems only fair that family dysfunction can also lead to an increase in beer. Fraternal Discord: Good for the Craft Beer Movement™. 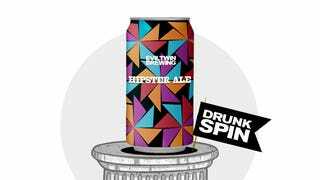 Anyhow, Evil Twin beers tend to be slightly less weird—which is not to say better or worse—than the Mikkeller numbers, so they're up first on Drunkspin, and let's start with their 5.5-percent-ABV pale ale, Hipster. I know what you're thinking. You're thinking, "Ha ha, sucker, I'm not even reading this far, I'm already down in the comments section haranguing you for something entirely unrelated to beer, because the word 'hipster' makes me very scared and angry, but I try to cover that up by pretending it makes me bored, so my comment will likely include some condescending yawn action." I know. I know. These last couple paragraphs are always just typing practice, but here we are. The Danish brewing twin we're dealing with today also runs a fancy beer bar in Brooklyn. To put that into some useful context, let me explain that this additional bit of information tells us he's a guy who runs a fancy beer bar in Brooklyn. That's it. The marketing copy for Hipster Ale presents the name as an earnest, friendly, and inclusive invitation for us all to consider ourselves hip regardless of our particular geographical circumstances: "Hip without borders," they call it. I can dig that. I've worn my cargo shorts and white sneakers all up and down some of the coolest and lamest neighborhoods in the country, and I haven't noticed my character changing much from one to the next. I don't trust the shifty, empty sort of person who lets his address do too much of his talking. Evil Twin Hipster Ale is hazy golden orange with a fluffy white head. It smells like flowers and bitter orange peel; when you drink it, you get standard American pale ale impressions of caramel and light pine resin at first, but then along come biscuits, wheat, dirt (the good kind, like where tomatoes grow), and grapefruit. The finish is mostly peppery, but there's also a unique, slightly salty note that adds another dimension of dryness to the usual hop effect. This excellent beer is both cool and approachable, just like you and me.